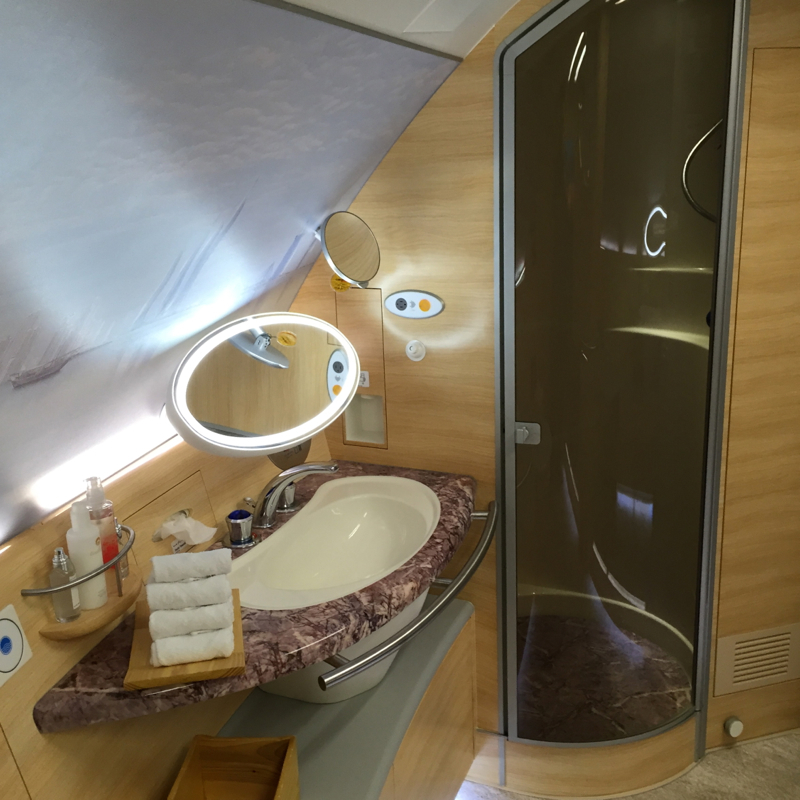 This Emirates A380 First Class Review is part of a trip report including luxury resorts in the Maldives, such as Four Seasons Landaa Giraavaru and Soneva Fushi, as well as Etihad First Class and Japan Airlines First Class. 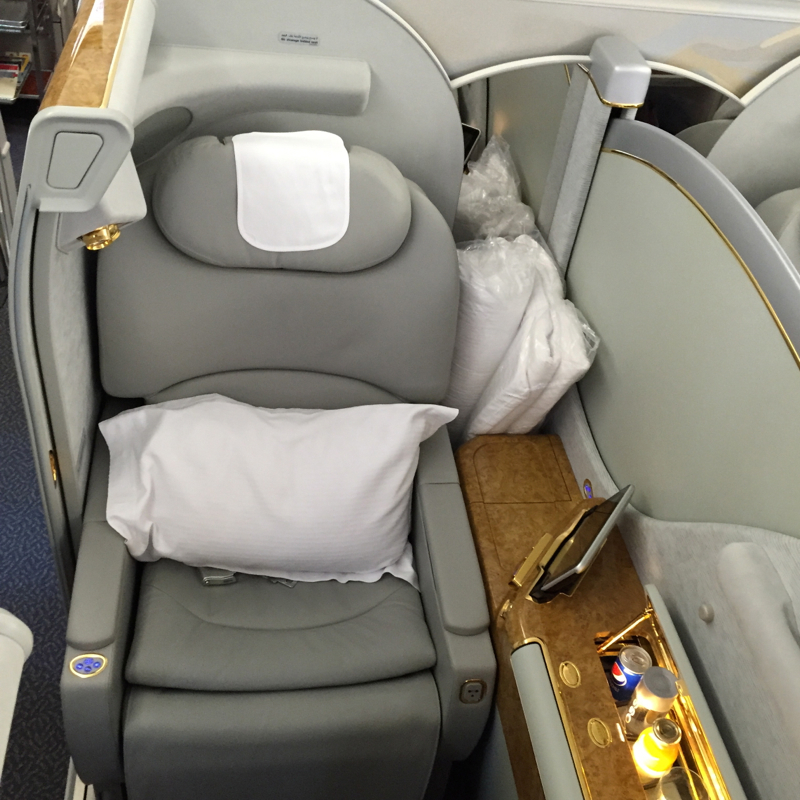 Emirates First Class on the A380 is a large cabin, with 14 first class closed suites on the upper deck. As usual, I'd recommend not selecting seats in the very first row (1A, 1E, 1F and 1K) or the last row (4A and 4K) if you can avoid it. Solo travelers will likely prefer window seats 2A, 2K, 3A or 3K, while couples who want to be able to easily talk to each other will want 2E and 2F, or failing that, 3E and 3F. 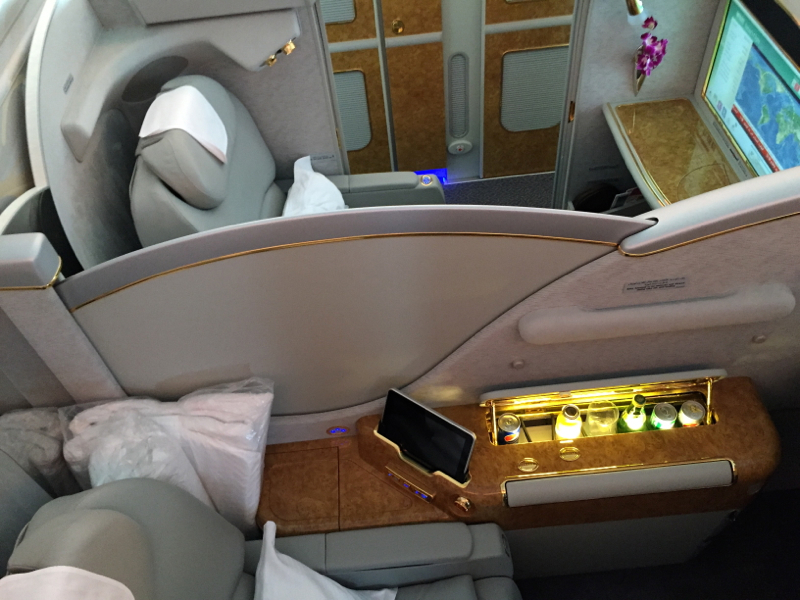 I was flying from Dubai to San Francisco for a 16-hour flight, so I was very much looking forward to a beginning-to-end First Class experience, especially after thoroughly enjoying the luxury of the Emirates First Class lounge (mini-airport) in Dubai. The flight attendant greeted me by name upon boarding, and offered a drink. Because it was the morning, I asked for a simple glass of water, and was given various options (flat or bubbles, room temperature or cold). My seat was #3K by the window. 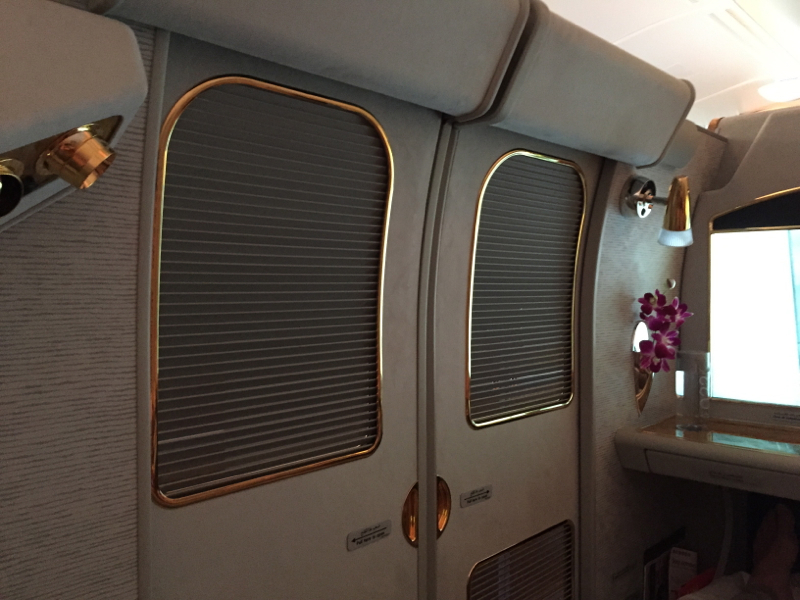 The design embellishments of this First Class flight really are quite unique: I felt like I was in a women’s bathroom at a high-end Las Vegas casino. In front of the chair is a little desk/entertainment system/cosmetics counter featuring not one but two metallic gold lamps, a floral arrangement, a little basket of junk food, and a vanity mirror. 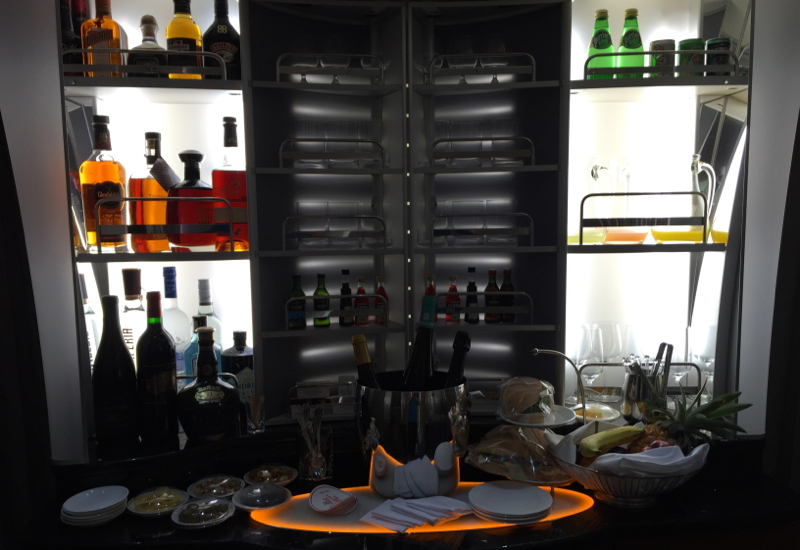 While to the right of the seat, built into the window console is a mini-bar, stocked with soda, water and juice. Depending on your taste, this arrangement is either delightfully handy or gaudily garish. 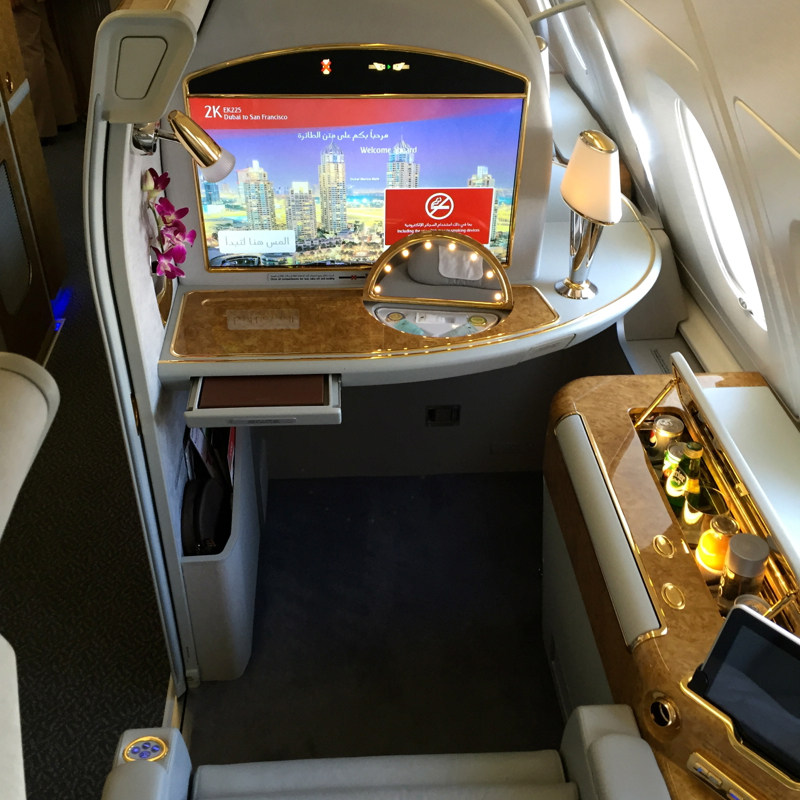 Immediately after settling in, I was shown how my chair could be controlled by the usual console, or by an iPad that docked next to my seat. I don’t care much for iPads, so I found having one always knocking about was generally a nuisance. But I suppose if you are someone who has a hard time remembering your name and address without using an iPad then this might be an important accessory for you. 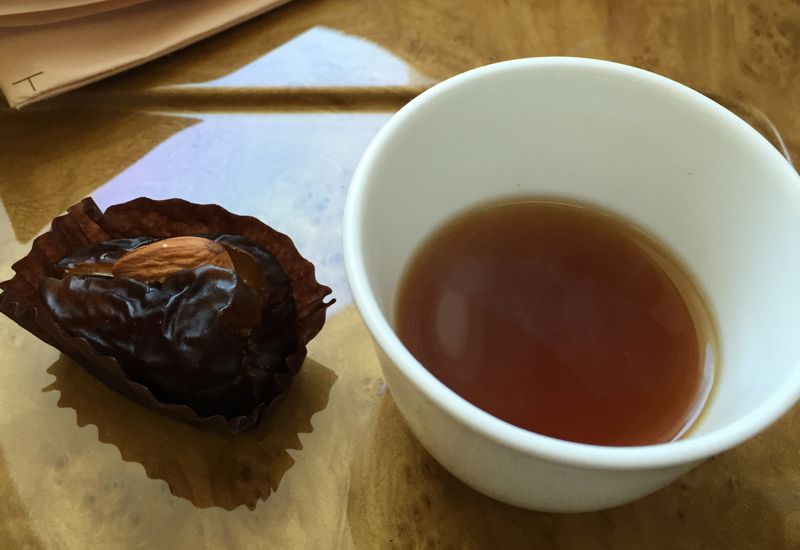 In quick succession I was next offered a newspaper, a date, Arabic coffee, a magazine, and a hot towel. My flight was delayed on the ground for about an hour so I enjoyed the date and coffee, and warily eyed the Toblerone bar in my basket of junk food. I loved the pajamas, which have become my go-to pajamas I wear at home. The extra large size is long enough for me, and the fabric is very soft and warm, but breathes well. 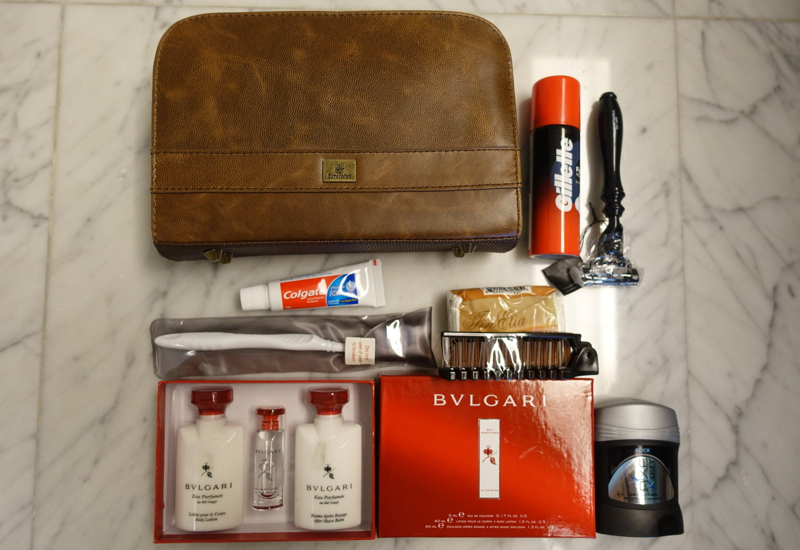 The amenity kit isn't something I used on the plane, but it was in a handsome leather case and included Bulgari amenities. 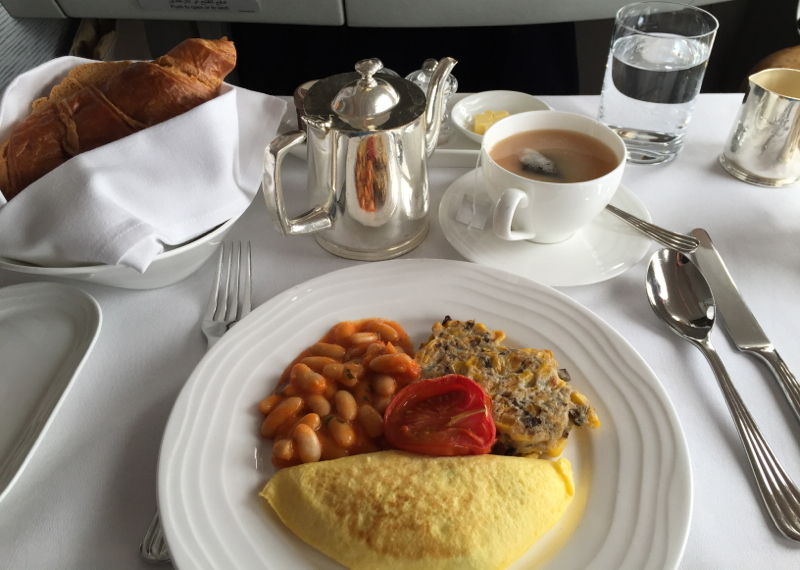 After the initial Arabic coffee and date, I chose to have breakfast shortly after takeoff. I ordered the Gruyere omelette, which was quite good. Unfortunately, the mushroom corn fritters were not very fresh, and were rather soggy and limp. 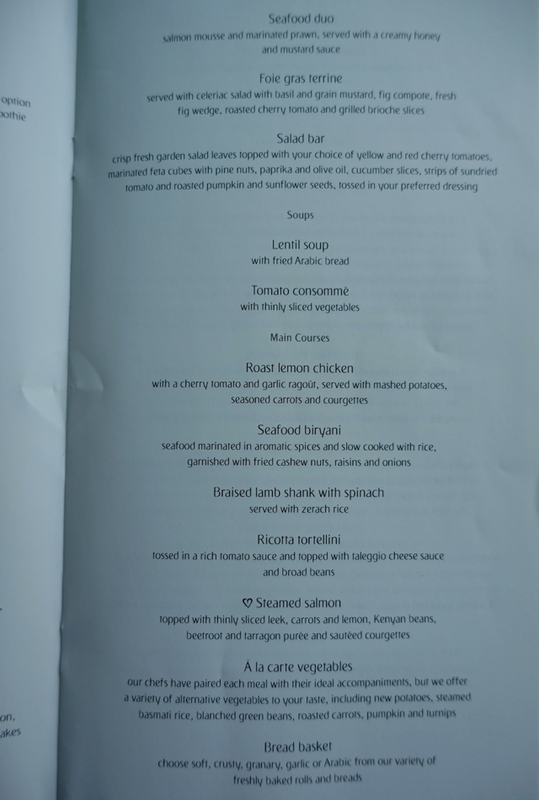 On the other hand, the baked beans were spicy and rather tasty, and the roasted tomato was sweet and juicy. The bread basket was too much bread and not enough pastry for my sweet tooth, and even the almond pastry and croissant were pretty bland. 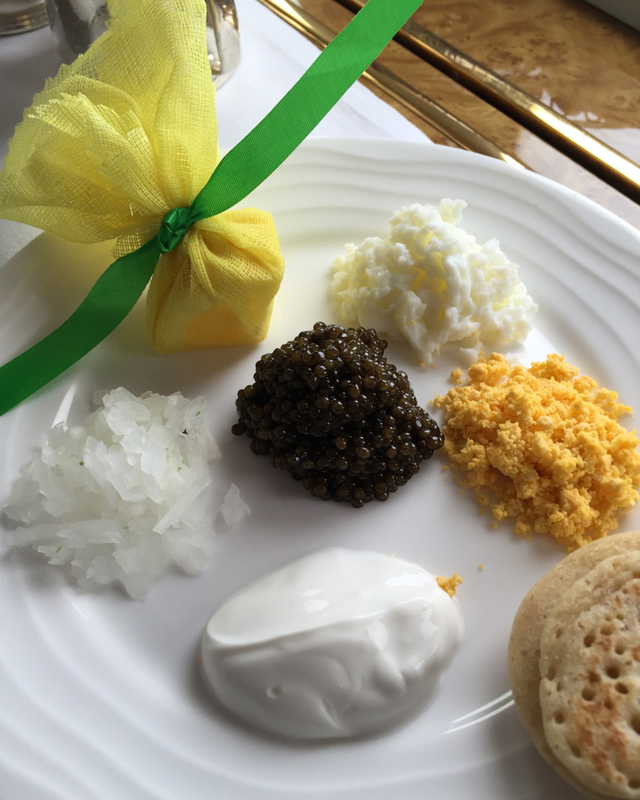 After watching my first film, I asked for the caviar plate, which was very satisfying. Later, a box of Godiva chocolates was brought with a fresh towel, which were both welcome. When I asked to have my bed made up, I returned to my seat to find a small fruit plate waiting for me, which I chose to neglect, having already brushed my teeth. After I awoke from an 8-hour sleep, I ordered the fois gras terrine with glass of 2004 Dom Perignon. The fois gras was very good, with half fig and chutney, but the accompanying bread was again too limp and not crisp, while the tomato and celery salad were better. For my main course I ordered the braised lamb shanks, which was another disappointment: too tough, chewy and dry. 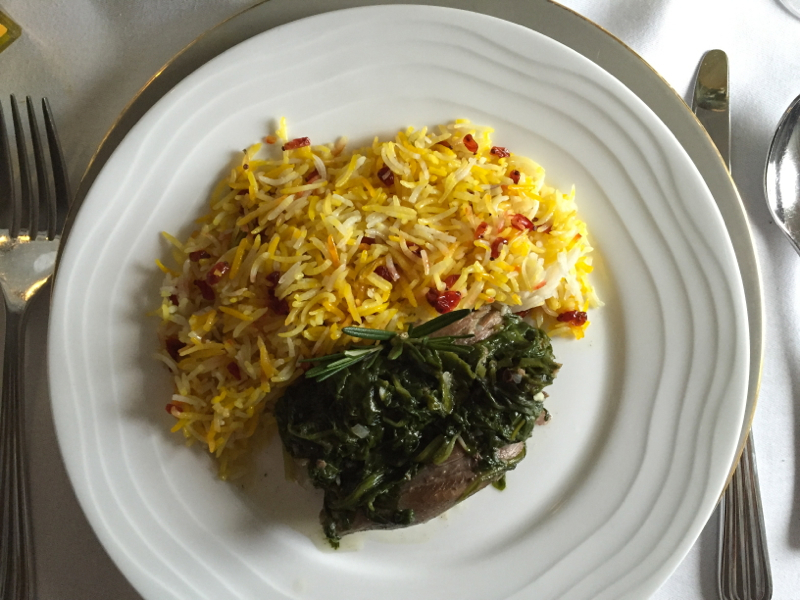 The spinach side was better, but the rice was tasteless. 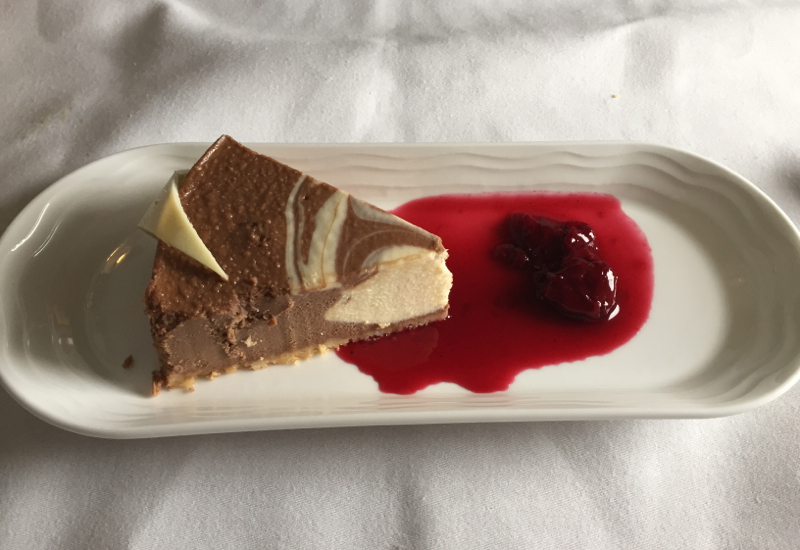 The dessert at least was better—I ordered the chocolate cheesecake, which somewhat salvaged the meal. 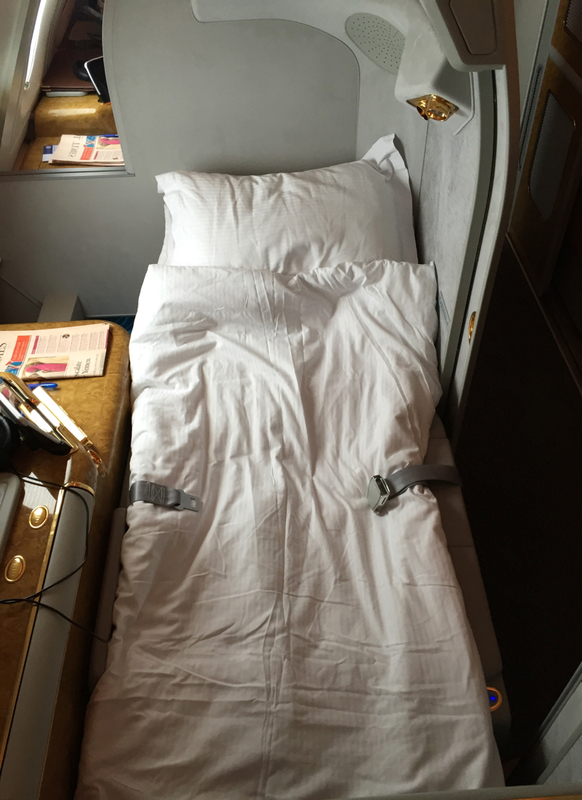 While I headed off to the bathroom, I asked the attendant to prepare my bed. With the added pad, the bed was relatively soft. The area for the head is slightly raised, which I liked. I slept very soundly for about 8 hours, and had plenty of room to lie flat, even at my height of about 6 feet 5 inches. I have to admit: the shower was heavenly. After having been airborne for 12 hours, a nice, hot shower is an exceptional feature. The bathroom was very spacious, and was always kept perfectly organized and spotless. Even the floor was heated! The staff were very helpful in explaining how the shower worked (5 minutes maximum) and in directing me to the amenities. The water pressure was good. A delightful experience. There was an abundant offering of in-flight films, which were usefully catalogued by film category and language. There was world cinema, new movies, film club, scary movies, Arabic cinema, Bollywood, Indian regional, classic, Disney, etc., in dozens of languages. I watched Liam Neeson and then Pierce Brosnan separately try to pretend that each is still young enough to play a tough guy and/or romantic spy. I also watched Guardians of the Galaxy, which was wonderfully entertaining, especially the talking raccoon and walking tree (who are pals). The noise-cancelling headphones were quite comfortable, even after those three full-length films. The service was quite good. Whenever I pressed the service button, someone arrived in about five seconds. The attendants were always cheerful and very gracious, and I found it very easy to help them understand my wants, which is not always the case. The overall experience was not quite the beginning-to-end flawless luxury I had hoped for, but the shower was an amazing experience and the overall comfort of the chair/bed help me to forget some of the shortcomings, such as the food quality and questionable design elements.